From my early travels I had a love for collecting souvenirs. I travelled within the country, collecting things that were cheaper versions of local handicraft, which sat on the showcase before I got bored of them. When I began travelling outside our country, I saw wonderful branded souvenirs that came as t-shirts, fridge magnet, pen stands, wallets, bags, etc. I mean we all have seen union jack on t-shirts and bags and have seen enough I love NY sweatshirts. For a long time I kept thinking of lack of such cool products which needn’t necessarily be hand crafted but showed versatility and colorfulness of our nation. It was sometime two years ago, I first stumbled upon Chumbak. Its funky, cool, vibrant and wide product range immediately had my attention. It cannot be explicitly called a brand that depicts India, but I feel it shows the spirit of the county with its hip designs. I recently bought a mobile cover and I was quite impressed with the variety of prints they offer. Second thing which is impressive about them is the right marketing that they are doing with pop up stores and tie ups. They are present at all major airports and have some of their collections displayed at most souvenirs stores. It might be an early comment but so far, little products that I have used are good quality too. Indeed it is value for money. 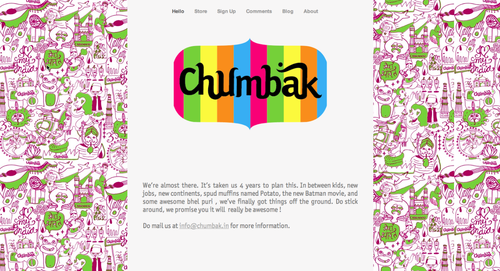 Chumbak is also available online at http://www.chumbak.com/. For couple of years, our country and our capital has been in limelight for corruption. Anyone, Indian or non-resident Indian can talk at full length on corruption. We all uniformly believe that the corruption is a root cause of many problems. Be it mid-day meal case or lack of women security; poor infrastructure or terms with neighboring nations. We believe that somewhere it is because of our politicians who eat up the entire budgeted fund and do not do anything in country’s favor. We stood in support of Anna Hazare, pledge to vote Aam aadmi party, shared viral information from wiki leaks but we didn’t change ourselves. When a cop stops us for over-speeding, we give him a hundred rupees note. When a cop stops us for drunken driving, we give him another hundred rupees note. When our bills are due for long time, we pay the teller at the department to get it signed off. When we don’t get permission from department, we pay under the table to get approvals. When we keep a tenant, we pay to local inspector and don’t pay house tax. When we are stuck, we ask someone to call someone who knows a minister and get things moving. From an auto-driver to a businessman, each of us, we do our bit to encourage corruption and then blame it on government. Sometime for hide our mistakes, something to smoothen the process, sometimes to just show who the boss is. We all are corrupt in our small ways. I am quite upset about the end of this festival. I have had a great time writing and reading. But today, I don’t feel like writing at all. Keeping in mind that this is the last post for the festival I decided to go a little expressive about the city I have come to love even after its unique characterstics that amuse me. This is a personal list, so I hope I am not offending anyone. In light of the recent debate upon depreciation of value of rupee, corruption, lack of security, etc. I often found myself loathing the nation that I was born in. I no longer remembered the moments of proudly singing the national anthem and saluting to our national flag. I started comparing my life to those who are settled in developed countries. But then amidst all this something happened – a discussion with a friend who is totally anti-India made me think that somewhere within me is someone who still believes in the greatness of this nation. This post is a mere reflection of turmoil that goes inside my brain and maybe yours too.